NO REFUNDS POLICY! ENTER AT YOUR OWN RISK! YOU MUST SHOW PHOTO ID AND CREDIT CARD USED FOR ONLINE PURCHASE WHEN YOU VISIT THE FARM! Your ticket is a revocable license and may be taken and admission refused upon refund of purchase price. Holder of this ticket understands that there is inherent risk involved with attending any of our haunted houses. Holder voluntarily assumes all risk and dangers associated with participation in our haunted houses. In consideration and acceptance of entrance into our haunted houses holder agrees to release the operator, parent corporations, affiliate, officers, directors and employees and landlords from any liability, harm, injury or death, cost or expense whatsoever that may arise directly or indirectly, from attending any of our Haunted House or any of the attractions at any this location. Rain Checks: In case of rain we will honor your ticket on any other night from time of purchase through. No refunds will be given due to rain. We reserve the right to close our attractions any night offering customer other nights to attend. 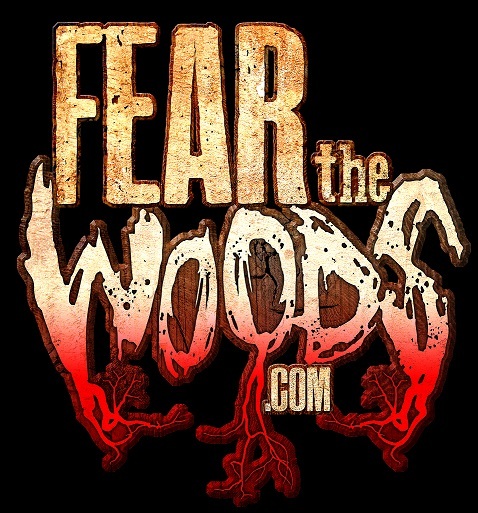 Fear the Woods reserve the right to refuse admission to anyone. You will experience intense audio, lighting, extreme low visibility, strobe lights, fog, damp or wet conditions, moving floors, special effects, sudden actions, and an overall physically demanding environment. 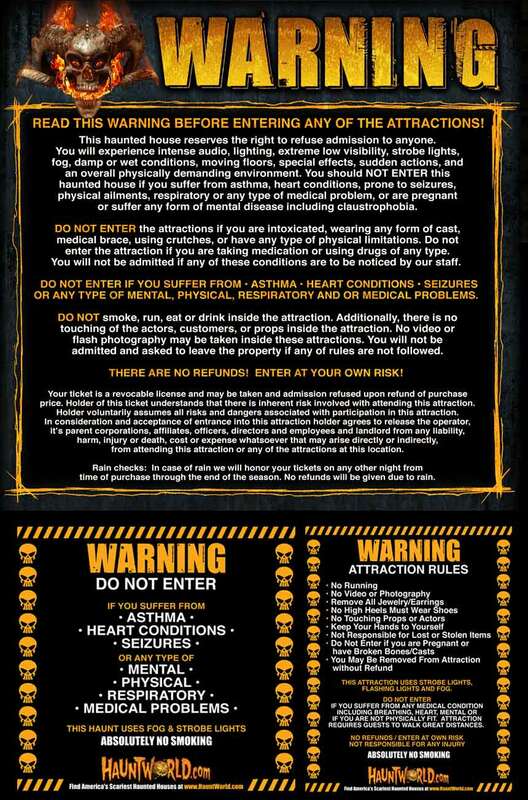 You should NOT ENTER a haunted house if you suffer from asthma, heart conditions, prone to seizures, physical ailments, respiratory or any type of medical problem, or are pregnant or suffer any form of mental disease including claustrophobia. DO NOT ENTER the attraction if you are intoxicated, wearing any form of cast, medical brace, using crutches, or have any type of physical limitations. Do not enter the attraction if you a raking medications or using drugs of any type. You will not be admitted if any of these conditions are to be notices by our staff. DO NOT ENTER IF YOU SUFFER FROM | ASTHMA | HEART CONDITIONS | SEIZURES | OR ANY TYPE OF MENTAL, PHYSICAL, REPRIRATORY, AND/OR MEDICAL PROBLEMS. DO NOT smoke, run, eat or drink inside the haunted house. Additionally, there is no touching of the actors, or props inside the haunted house. No video or flash photography may be taken inside the haunted house. You will not be admitted or asked to leave the property if any of these rules are not followed. THERE ARE NO REFUNDS! ENTER AT YOUR OWN RISK!